1936 On the 19th of July the Nationalist troops which had just landed at Algeciras made use of a gunboat to shell the barracks. By noon the anti-government forces had captured La Linea. All day hundreds of frightened people made their way to the Rock seeking refuge. In the afternoon, fishing boats from La Atunara began ferrying passengers to Catalan Bay. Others used small rowing boats. One Sunday, while the Chipulina family was spending the day at Eastern Beach, they suddenly became aware that something unusual was happening. People were standing up, some of them running and pointing out to sea. The sound of rifle fire crackled in the distance as at last they caught sight of a tiny black dot far out on the Spanish side. Beyond the fence the greenish uniforms of the Guardia Civiles with their rifles pointing out to sea were also now visible. The refugee began to tire and several onlookers swam out to help. After what seemed an eternity, they finally made it to safety. As the thin young man lay gasping and shivering on the sand, a sympathising crowd gathered round. Someone brought a towel to drape over his shoulders; another brought a thermos flask and gave him a cup of hot tea, offering words of encouragement. Finally the duty policeman, having little alternative, told the man that he would have to accompany him to the station. The refugee looked up with an exhausted grin and nodded. 'Will you let me lie here just a little longer?' he asked. Eastern Beach on the summer the Spanish Civil War started.. This is a rather attractive photo of the children who made up part of the group of family friends who spent much of their holiday time on Easter Beach or Mar de Levante as it was also known. My sister Maruja is on the left. Eastern Beach. This rather out of focus snap was taken on the same day as the previous one. 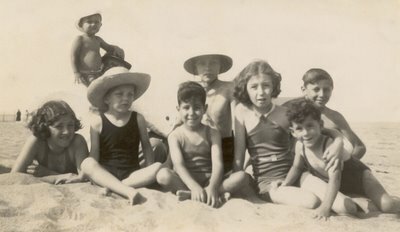 My mother is fourth from left with the towel over her shoulder and her daughter Maruja on her left. My father is fifth from right with Eric on his left. 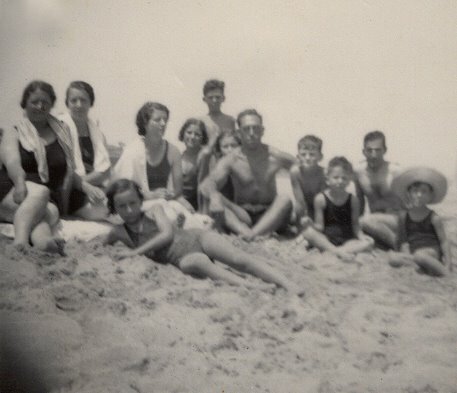 The family seems to have had a penchant for group beach photographs as we seem to have accumulated quite a few of them over the years. According to Harington, who was Governor at the time, nearly 4 000 people rushed into the Rock that day. Many took up residence in hulks in the harbour or in overcrowded slums. Some even hid in caves. Meanwhile refugee camps and soup kitchens were set up in North Front. Tourist traffic came to a complete halt. All told it had been estimated that at the height of the crisis some 10 000 refugees of one nationality or the other entered Gibraltar. 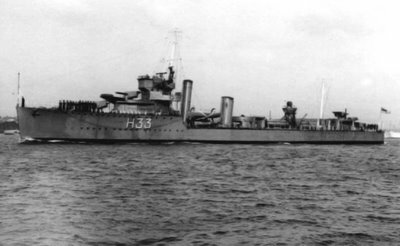 On the 21st of July two Spanish heavy cruisers and a destroyer entered Gibraltar harbour during the night requesting fuel. On the orders of the Republican Government the sailors had overpowered their officers and taken over the ships. The Navy refused to give them any fuel but were willing to allow local merchants to supply them. One of the local worthies, acting on behalf of the coal merchants, told the Spanish Consul that the merchants would supply the coal if the sailors released the officers. On being told that there were no officers aboard, the gentleman replied that in that case they had nothing to sell. On that same day La Linea was bombed again. 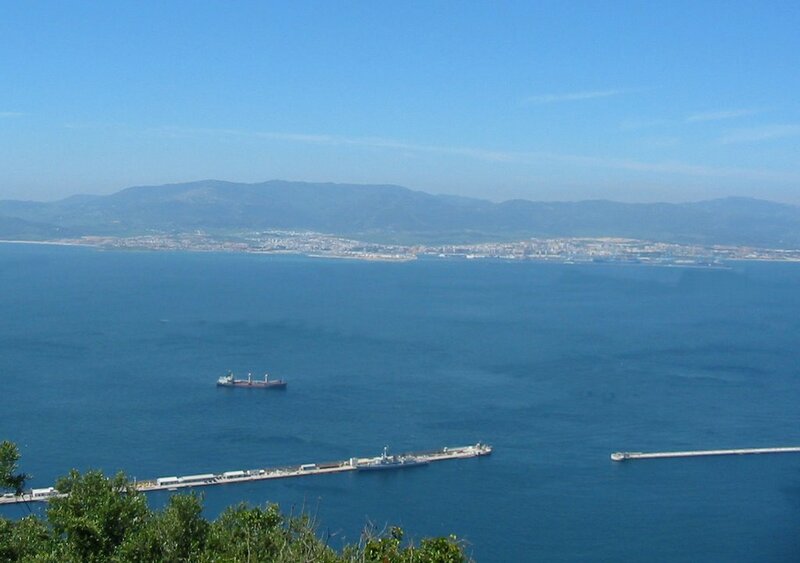 On the 25th of July it was the turn of Algeciras. Eric and Maruja were eye-witnesses to this. When the Chipulina children were young they often went to the Alameda Gardens in the afternoon to play and have tea. In the best traditions of the bourgeoisie they were always accompanied by their nanny. From the lower part of the gardens, overlooking la Bateria, they had a perfect view of Algeciras. From a distance the flashes and puffs of smoke looked relatively tame. In any case the children were too young to have any idea of what was going on. The children's first nanny was a substantial lady called Miss Matilde Peñalver, known as Miss Tilly for short. She was the daughter of a huge Dockyard policeman. The family were renowned as prodigious eaters. Miss Tilly is on record as having once told the children that during a picnic, 'habiá sobrado una torta de patata y porque ya no podian comer mas, de coraje se lo refregó por la cara.' Presumably this was the next best thing to eating it. There was also a housemaid called Maria who was very simpática. This was also probably the time when my father became disgruntled with his job in the Cable and Wireless and set up a newsagency and stationery business in a shop close to 256 Main Street. It was called 'The Art Shop.' His cousin, Antonio Sacarello, who also owned a newsagency shop in Main Street helped him with the preliminaries. Despite the limitation imposed by the small size of the shop, my father seems to have been quite enterprising and eventually provided for a wide variety of tastes. Apart from managing to squeeze in a small but well stocked lending library, he also sold the latest editions of 'Jane's Fighting Ships', Blackwood's Magazine, sensational thriller paperbacks with garish front covers, large heavy ice-boxes and even some rather eccentric items which were probably office desk accessories. He also catered for philatelists as he had inherited a keen interest in stamps from his father Angel (2.1) , as well as his considerable collection. Most were sold in packs labelled '100 stamps, all different'. Although Pepe (1.1) had no political affiliations he was in principle or instinctively anti-fascist. He sold most of the Republican newspapers and made a point of displaying them prominently. The U.K. newspapers were purchased through an agent called Gordon and Gotch. There was some arrangement whereby the shop obtained a refund or rebate on unsold papers. All that was required was to tear off the top with the name and the date and send it back. Eric, who was often commandeered to help, often browsed through endless copies of the News of the World. They had excellent sports coverage in those days and from these left-behind papers he became very well versed in the U.K. soccer of the era. The sports section also had an excellent caricaturist who specialised in sketches of well known footballers. There was a particularly good one of Bill Shankley, the man who was later to become the father of one of the great Liverpool teams. He was then a player for Preston North End, the team which Eric supported. 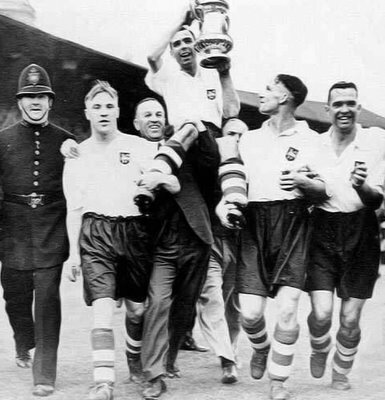 Preston North End winning the FA Cup in 1938. They beat Huddersfield 1-0 after extra time with a last gasp penalty. My brother Eric’s hero Bill Shankly is on the left. The children particularly looked forward to Sundays when Pepe would regularly bring them back comics from the shop. Chicks Own, Comic Cuts, and Tiny Tots, were the most sought-after publications. On the 5th of August, a heavy levanter day, the destroyer Lepanto was hit by a bomb and entered Gibraltar harbour. The British confirmed their neutrality by ordering it to leave or risk being interned. The ship moved out. Some time later the Spanish Cruiser Canarias, a modern light cruiser with rather graceful lines was sunk off Gibraltar by Republican planes and the survivors were picked up by the Royal Navy. 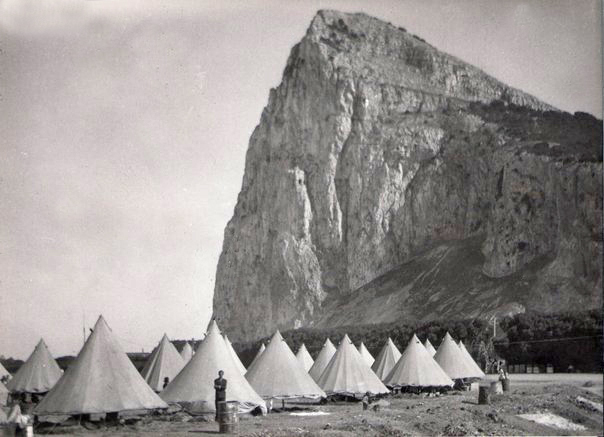 Pepe (1.1), who was friendly with the Naval Postmen who often visited the Art Shop, got a first hand account of this event as he did about much else that was happening around Gibraltar at the time. There must have been quite a few stories to tell about the Gibraltar based destroyer Vanoc, a ship that logged some 17 000 miles in one year as she shuttled people in fear of their lives from one Spanish Zone to another including Republican refugees who dared not return to La Linea. The Gibraltar based destroyer HMS Vanoc. Later during the war, the Vanoc would also become famous for several other exploits including the ramming and sinking of the german submarine U-100 One way or another, the Civil War touched everybody in Gibraltar either directly or indirectly. Just next door to 256 there was a fruit shop called Perez & Navarro. The family were regular customers. One of the partners, it is not quite certain which, had an unpleasant time during this period, although he had never been involved in politics. At the outbreak of the conflict he had happened to be a member of a social club in La Linea where he would often relax with friends over a few drinks and perhaps a game of dominoes or chess. Club members, however, tended to be left-wing sympathizers and when the fascists took over he fell under suspicion. They couldn't accuse him of anything but they never left him in peace. In Malaga, the city was in effervescence. There were innumerable strikes and boycotts and the Hammer and Sickle was to be found everywhere. The most popular slogans were 'Long live Russia!' and 'Down with Spain!' The peasants were in revolt, burning churches and farms, but there was a tendency not to molest foreigners. At the time of the Nationalist Coup, the city was under the control of workers' syndicates and many priests and right-wing elements were killed. This, together with the growing disorders, filled the upper and middle classes with panic and many tried to leave the city. 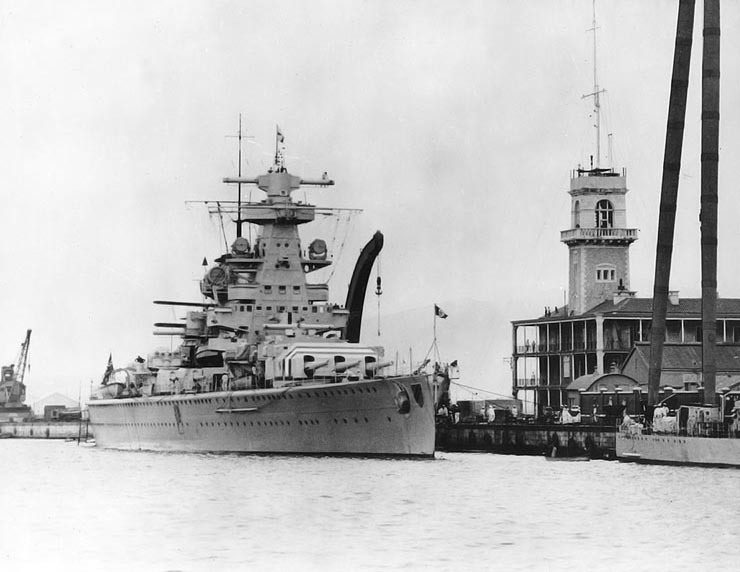 The German Armoured ship Admiral Scheer in port at Gibraltar. This pocket battleship formed part of the International Control naval units set up during the Spanish Civil War by the European powers as a coastal control system to discourage the entry of foreign combatants. 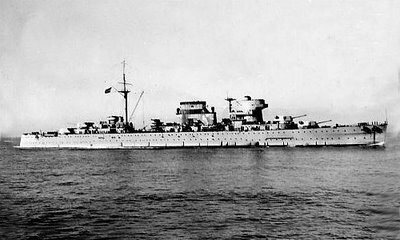 These ships showed their so-called neutrality by having red, white and black strips painted on their forward gun turrets. The inclusion of German ships in these units helped Germany maintain the façade that their military aid to Franco was made up of volunteers. The building on the right was the Royal Navy Headquarters in the Dockyard. My mother was always very impressed by the formal politeness of the German mariners whenever they happened to enter the family shop in Main Street with much saluting and clicking of heels. 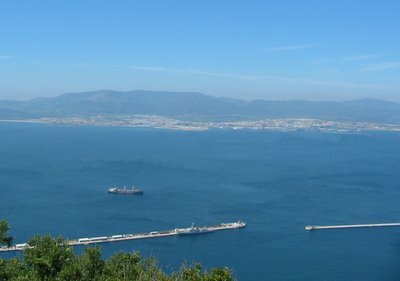 The road to and from Gibraltar was soon closed, but Malaga could still be reached by sea. As the Captain of the Vanoc wrote many years later: 'Lying off the Spanish ports we would hear splashing in the darkness as desperate men swam out to us from the shore. For many it was their last hope. They were under sentence of death.' A friend of the family who was married to a Spaniard was unfortunate enough to be living in Malaga at the time. Apparently the family had servants who happened to be Anarchist informers. Luckily they reported to their bosses that their employers had never discussed politics in their hearing. One can almost hear the sigh of relief. When the Nationalists finally entered Malaga, they took a frightful revenge, executing 4000 people in the first week only. To finish off a wonderful year, Hitler took the Rhineland, and Eric went through the ritual of Confirmation. This was a church ceremony which Catholic children were forced to endure when they came to what was known as the 'age of reason'. It was then the practice for parents to dress up their little boys with mini-admiral or comic opera type costumes both for Confirmation and later for First Communion. Luckily for Eric, his parents were both civilised and sensible enough to refuse to bow to peer pressure and dressed him up in a plain white suit.